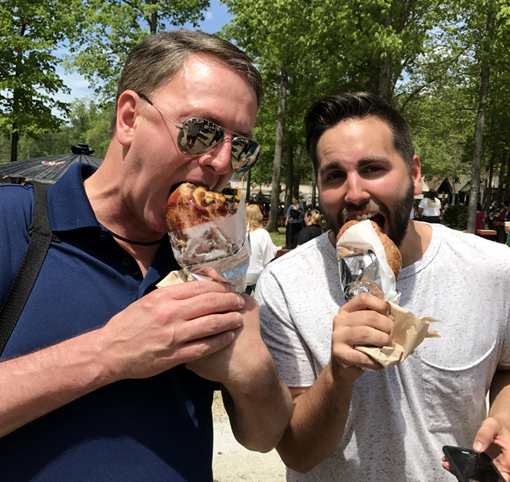 In my experience, every mention of "Renaissance Festival" is followed by three statements: (1) "Yum! Giant turkey legs! ", (2) "They're jousting, right? ", and (3) "Are you dressing up?" 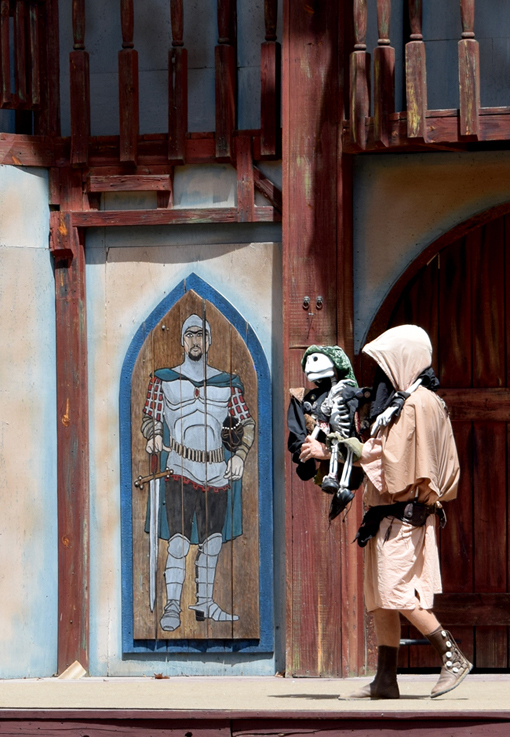 The Georgia Renaissance Festival has all of that and so much more! And you can get in on the fun every weekend now through June 4, 2017. There is indeed jousting, as well as masterful feats of horse riding skills, and there are sword fights! All for the King and Queen of the tournament, and we common folk. This is the one time it's super fun to be common folk! However, if you'd like to be seated under cover during the tournament, I recommend purchasing your VIP tickets as soon as you arrive. By time we went over to watch the tournament we were relegated to watching from a hillside. Don't' get me wrong. There are no bad seats, but the earlier you go, the closer you will be to the action! My dear friend Nikki—my partner in the "By the Numbers" series—gave me four tickets to the RenFest that she and her husband had won at a local Trivia Night. I took my dear friends Patti (that's her above with a cosplaying festival-goer) and her husband Eric, and our new friend Cody. Such a fun crew to hang with! 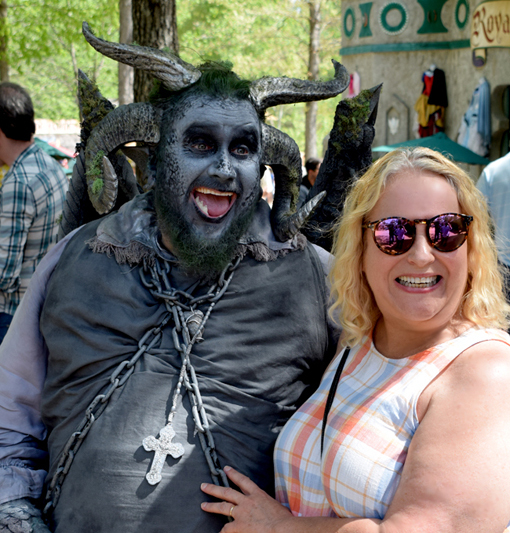 While at this festival, we made photos with the RenFest Queen; participated in an archery competition when Eric kicked our collective butts; feasted on giant smoked turkey legs; sampled a few beers; and got kissed by a pirate. Well, Patti did the latter. 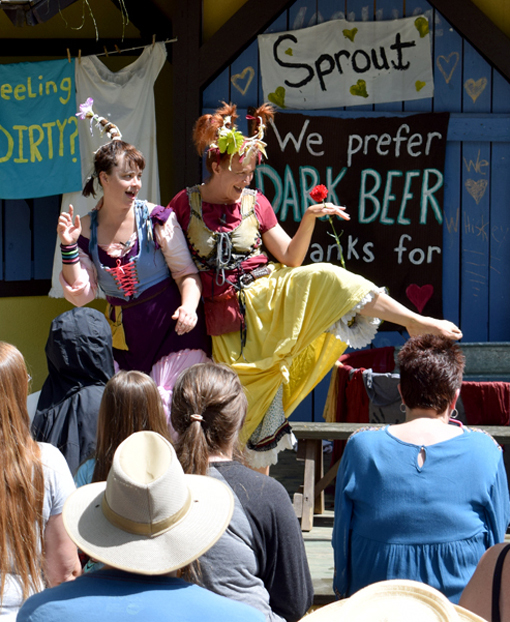 There are lots of shows at the RenFest, but none make your sides hurt from laughing like the Washing Well Wenches! I want to assume that these two have been working together for years...their banter flows so naturally. That's where "natural" stops. The next thing you know, you have a guy running up the hill, into festival foot traffic, yelling something absurd at the top of his lungs. And another guy running up the same hill wearing underwear on the outside of his pants, also yelling absurdities. It was hilarious! Do not miss this show!!! Seriously. Do...not...miss...this...show! There are so many incredible performances, you may find yourself in the same situation as me...unable to pick a favorite! Then I think, why can't I have several? I can!!! So can you! 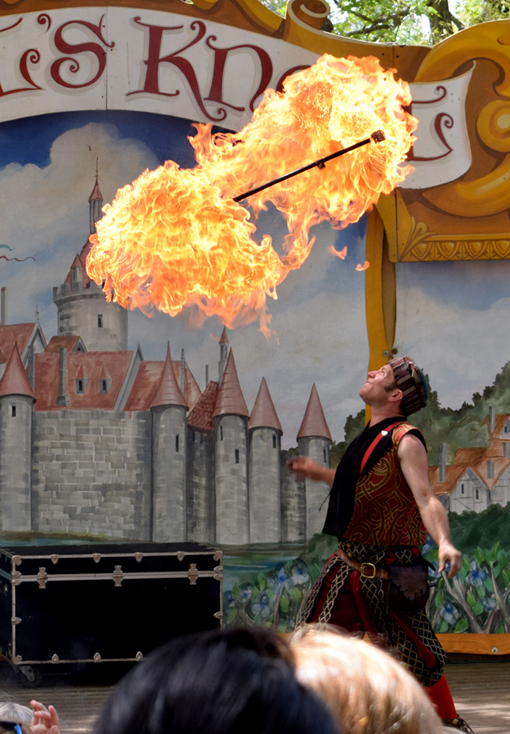 The Gypsy Geoff Fire Circus is AWESOME! We saw his show immediately following one of the jousting tournaments. The part of his routine when he invites kids to the stage to be part of the show started as typically as one would expect. In this case there were six kids on stage, super excited and a little bit nervous, listening intently to Geoff's instruction on how to balance a spinning plate on a long, skinny stick. We've all seen this, right? Then, the kids go "off script"! Without being instructed to, the first kid—who Geoff had passed a spinning plate to stick-to-stick—turns and passes it to the kid next to him—while Geoff was off getting another plate for the next kid. Geoff was going to give them each their own spinning plate, but the kids opted for a more challenging feat...to pass the same spinning plate to each kid on stage! There were a couple of spills (we'll call them practice runs), but these kids were determined to make magic! They passed the same spinning plate from kid to kid to kid, all the way down to the smallest of them...in a single spectacle! They did it!!! I think the above is my favorite photo from the day...that's Gypsy Geoff! You absolutely must see The Ded Bob Sho! What he's missing in flesh, he makes up for in banter that is oftentimes brilliant humor, oftentimes over-the-heads of some. If you're a worldly person or keep up with current affairs, you're going to appreciate your time with Ded Bob. Pay attention. The stage is massive—and in keeping with the festival's theme, of course—and there is audience participation, as there is in many of the festival's awesome shows and performances. With that said, Ded Bob is special...don't miss him! Yes, yes I was busting a vein getting into that giant turkey leg...but, doesn't everyone? All four of us had one. Well, most of one. We later saw one festival-goer who was carrying around—with great pride I assume—a turkey leg bone that had been rendered devoid of meat. It looked like it could have been plucked from Deb Bob himself, the bone was so clean! There is lots more to eat and drink, too...a LOT more! They have snacks and meals, beer and wine and margaritas, and they have a wide range of make-your-mouth-water desserts! And it's all available throughout the festival grounds. If you leave hungry or thirsty, it's your own fault! Just sayin'. I'd only been to one other Renaissance Festival, so I wasn't sure what to expect. Let me tell you...you can expect a festival done right! Did the festival designers engage archaeologists or sociologists who are experts in the Renaissance era? Probably not, but what they have done is perfect FUN! You will not find yourself sitting in a boring lecture learning European 1300-1500s history (I love history and read/watch it all the time!). You will discover a "rebirth" of what it means to relinquish being uptight, how to discard the drudgery of hectic work weeks, and how to shed the stench of stress. 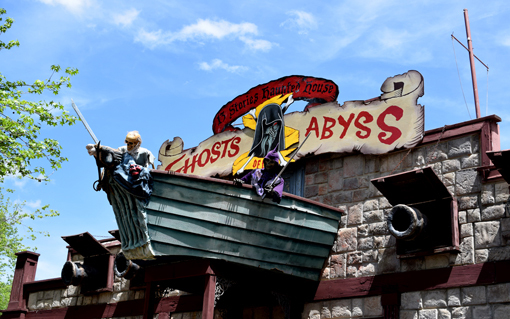 When you arrive, do yourself the great favor of relaxing into the fun. Go, have a great fun time! There are LOTS of animals at the festival, too! 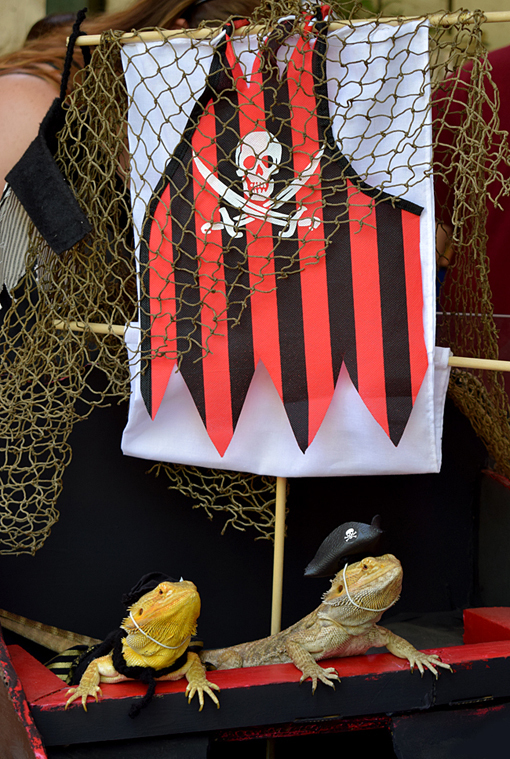 There's a falconry demonstration, the beautiful horses from the jousting tournament, camel rides, hawks, eagles, owls, and these two pirating lizards, to name just a few. 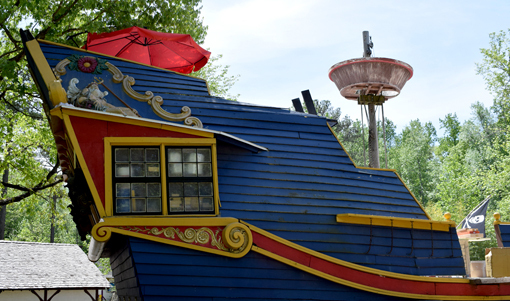 I highly recommend a thorough review of the Georgia Renaissance Festival website, just so you know how much is going on so that you don't miss something that you really want to see. Like me, you may want to visit multiple times so that you can do absolutely everything! The festival is every Saturday and Sunday through June 4, 10:30 a.m. to 6:00 p.m. 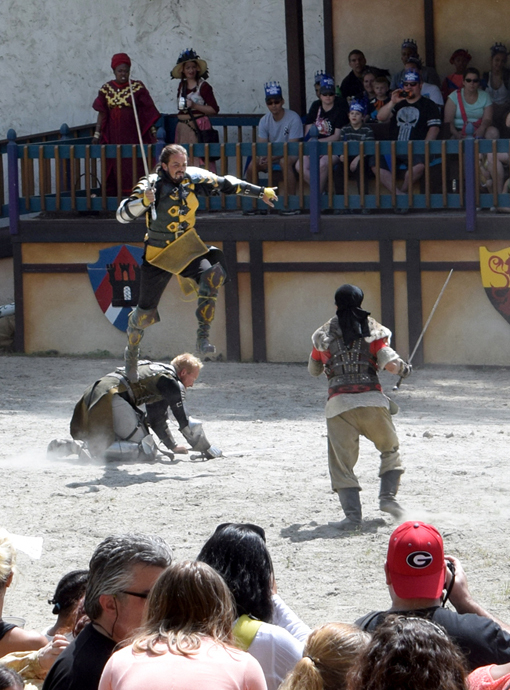 Call me a festival geek, but I highly recommend planning a FULL day at the Georgia Renaissance Festival...there's so much to see and do, you're going to need a full day to see and do everything! Go, have fun!